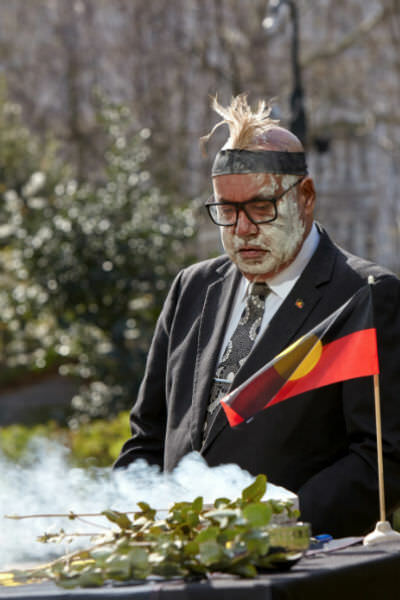 A few days later, London’s Natural History Museum announced the repatriation of 37 sets of Aboriginal remains, which will be held at the South Australian Museum before being handed over to their respective communities. One Aboriginal ancestor repatriated from London was discovered during excavation works by a mining company on South Australia’s Yorke Peninsula 100 years ago and donated to the British institution by a local doctor. Australian government policy on Indigenous repatriation recognises the colonial theft of Aboriginal remains for scientific experiments, historical exhibitions and private collections and calls for ‘voluntary repatriation’. The policy’s cultural protocols establish the Aboriginal and Torres Strait Islander community’s ‘responsibility to their ancestors to bring them back to country according to the Traditional Owner’s customs and laws’. However, while it allows communities to lobby and discuss with entities in possession of ancestral remains, the decision to repatriate rests with the individuals or institutions. The absence of enforcement results in delays in bringing the remains back to Aboriginal communities. In addition, the adherence to earlier colonial narratives about Indigenous populations, under which some remains were acquired, often necessitates a change in museum ethics. Read more.